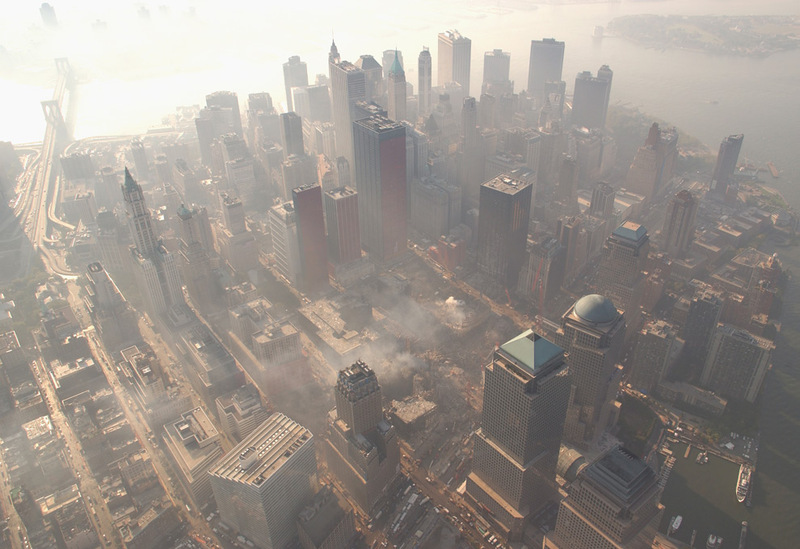 Since after the rubble was removed from "ground zero", the whole block showed itself as being entirely under the level of the street for many feet. 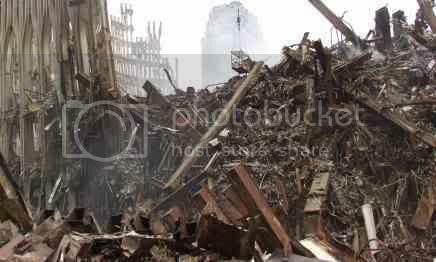 How would that be possible, if it was not already basically voided of structures during the demolition of the towers? If I were using my own default logic, however, I would agree with you. I see no other explanation at this time except a combination of expedient removal, posing of propaganda elements (real or digital) and a large amount of debris going into the holes. There was - after all - a subway connecting employees to the WTC. Can something better be suggested than what you say yet? I don't know. How was the thing shipped? In the Naudet film - which we might only believe because it would be hard to hide - they had construction cranes there for lifting to ships. The shot with the photoshopped firemen is proposed as an "earlier" picture, judging by the larger quantity of possibly photoshopped smoke. Maybe from the evening of 9/11. The picture with the car is proposed as a "later" shot, maybe of the morning after, when the first excavators have started making way by moving the larger pieces of rubble to the sides of church and cortland street (including the cars and other big chunks of metal). Never forget that to be useful in providing clues, the imagery should be clearly positioned in time, and when it comes to the rubble, the time can span across many days. But maybe my assumptions are totally wrong. reel.deal, what is the source for the pictures? Are those screenshots from a documentary or something? By Jove, Watson! You're darn right! That's most probably (meant to be) the very same police car. Bob: "Hey, that police car looks too clean. Let's set it on fire and flip it on its roof!" John: "Cool idea, Bob! Let's do it !" Bob: "Ok, and now d'you see that white-spotted, leaning black building?" Bob: "Let's set it on fire too - those chalky white spots are just silly ! " You're right, it makes no sense. My bad. And in this picture at the same scenery, we have the firemen and the "civilian" car, but no police car on top of it. Yes, nonhocapito, "we have firemen" in this last version you posted. It's all a flamin' joke. What could be the reason for a big player like History Channel to use such atrocious quality unless they were trying to cover up their CGI technology? Rubble in the Jungle. ReALIty versus ...? 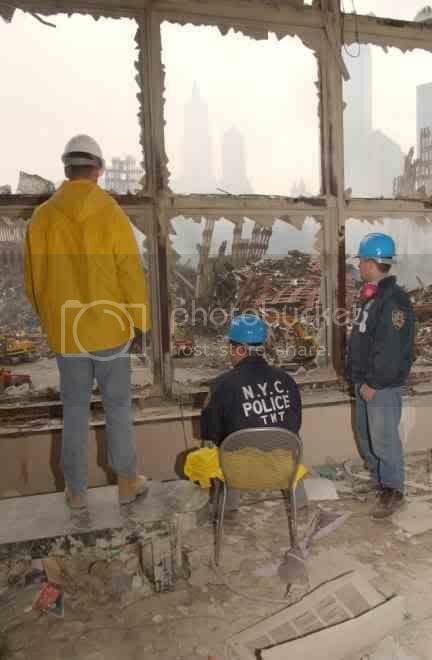 Here is an account of post 911 Manhattan from the point of view of the impact it had on a business. The story of a gym. 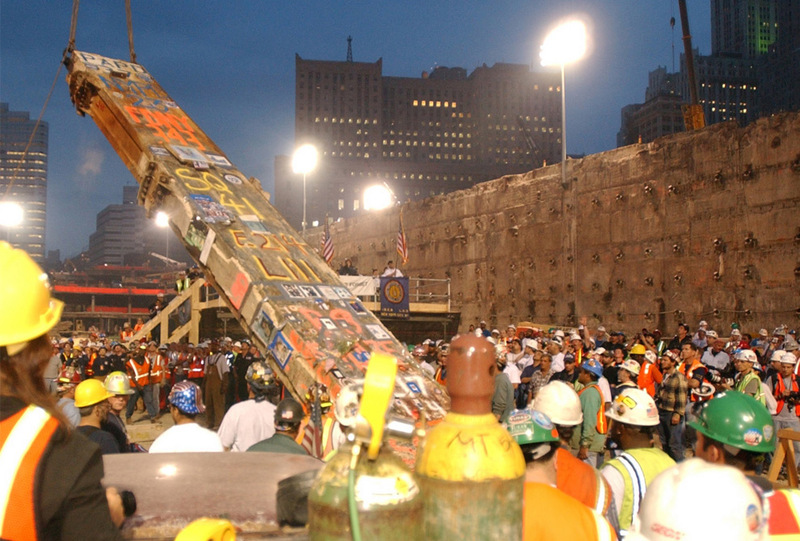 "Then, on Sept. 11, things went from bad to worse. 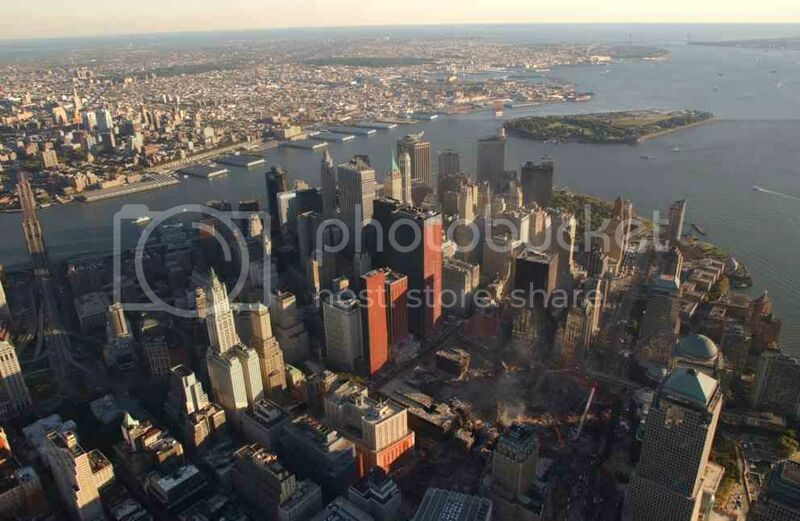 Few businesses in the U.S. were unaffected by the tragedy of September 11, and none were affected more than those located in the shadow of where the Twin Towers once stood. Tribeca is one of those areas. Authorities shut down lower Manhattan, which looked as though martial law had been declared. All businesses not related to the financial markets were essentially closed because employees and customers could not get to their locations. "It took us weeks to get back down there," says Wilson. "At one point, when we were trying to get our contracting crew down there, they wouldn't let them in without some sort of letter because the area was heavily patrolled. We couldn't get any trucks in. It was just very restricted." Meanwhile, losses at 24/7-Tribeca would amount to almost 3,000 a day while the doors remained shut in the aftermath of the tragedy. 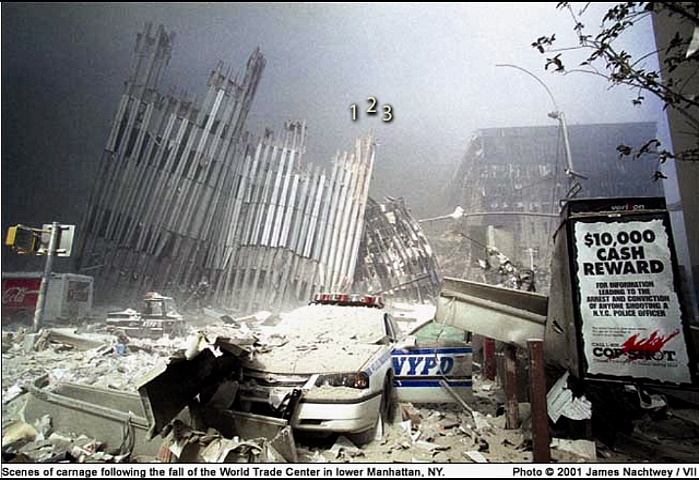 At least 20% of the gym's prepaid members worked at the World Trade Center. To help offset the losses, Washington and Wilson had stopped drawing full salaries by the end of September. "As far as sales were concerned, that was the end of it," Wilson laments. Though there was no damage to the Tribeca location structurally, the damage to the business was dramatic. "We put in an application to the Downtown Alliance and we did get a grant from them for 25,000. They also gave us a 25,000 loan." Tribeca would finally become more accessible in December, and 24/7-Tribeca would open its doors on January 2, 2002, one year after it was purchased, six months behind schedule, and 150,000 over projected costs." Martial Law. Papers please - or no entry. Only 'business' people allowed access to lower Man. Not until December before the situation eases. How difficult would it be to hide Godzilla under such circumstances never mind a realistic rubble pile? It seems a little corner of North Korea migrated to NY and settled merrily down there for some Autumnal session Sun King Kim loving. This photo looks real but is credited to FEMA! ? Yous lads eyes are more honed than mine. Anyway the sides of the buildings facing the site are completely covered in enormous red curtains? Are there a few fellows working in here? These are on display in a number of photos. Officially to 'protect' these facades or something, but unofficially to 'shield' prying eyes? This picture looks real to me but the date of October 4th I would say is rubbish. And another dated October 15th? impressive and scary. Everything just turned to dust. Wow. A small dusty debris pile. When in fact it probably took 3 months to get it down to this level and a million angle grinder rings. The moon, 911, nukes, sames tricks different pony. And then we come to this image. All paths lead back to Kubrick. The master and (evil?) genius of illusion. Terence.drew 4 Oct 28 2010, 01:34 AM wrote: Rubble in the Jungle. ReALIty versus ...? Perhaps it was the joke that knocked everyone out? Interesting post, showing the smoking flatland that was GZ. Red curtains seem not to have been issued to all buildings with view of the site, but perhaps there wasn't really much to hide from viewers in the buildings, assuming explosive residue would have been invisible, and missing bodies, plane parts and rubble not noticed or questioned. The Manhattan lock-down seems clear enough, but looking for more info. First hand account, anyone? 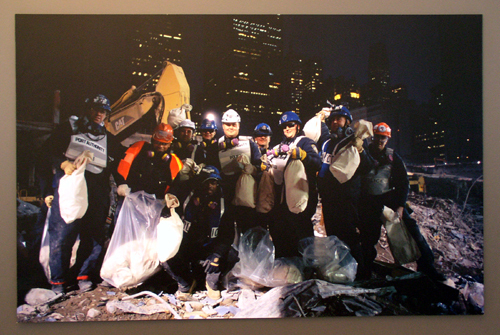 "Lower Manhattan, south of 14th Street, was off-limits, except for rescue and recovery workers." Still not clear why the lock-down, except to keep people out of GZ itself. Can't beat a bit of Ballet ..O the high culture of it all! Product placement and little joke at our expense. Look in the mirror. Look away! Look away! Don't study these pictures too hard ... absorb and move on. Absorb and move on. Don't you just love tough-feeted women.?...Ouch! beam at the yellow arrow. 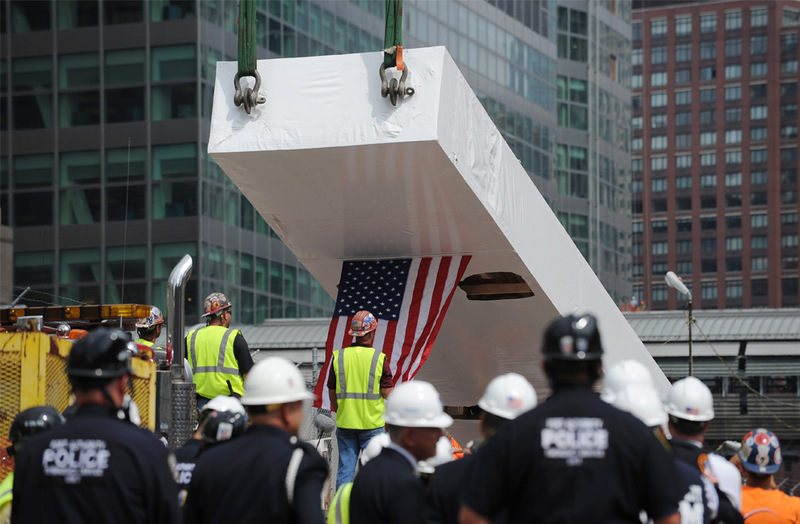 The WTC beams was thicker at the base and thinner as we move upwards the tower. 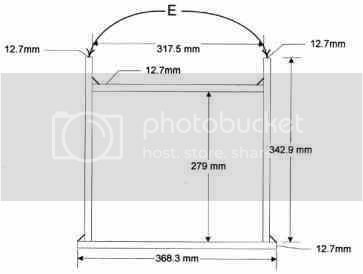 The joint between the perimeter beams consisted of four one inch bolts, or a cross section of 4x506.7mm2=2027m2. 1) On a windy day, if the beams (using only bolts) move due to wind force, the chief engineer will go to history as the man who built the screaming towers of N.Y.
2) Comparing the steel cross sections, it makes sense. 3) The additional construction costs are approx two full-time welders on each tower. This is not very expensive. 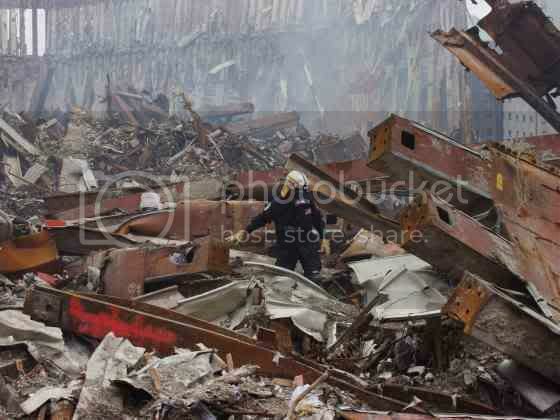 4) Archive photo exists that show welding in progress; see "Building the WTC". On these grounds we add (342.9 + 342.9 + 368.3)x(12.7) = 13387m2 for a total of 15413mm2. compared to the ordinary steel. when the tower was demolished. It has been put on the rubble pile afterwards. licorice-steel-and-fire scenario (completely impossible and also absurd) the picture is still in error. demolition (ha! ), the picture is still wrong. It still don't go. impossible, or your own favourite demolition scenario! 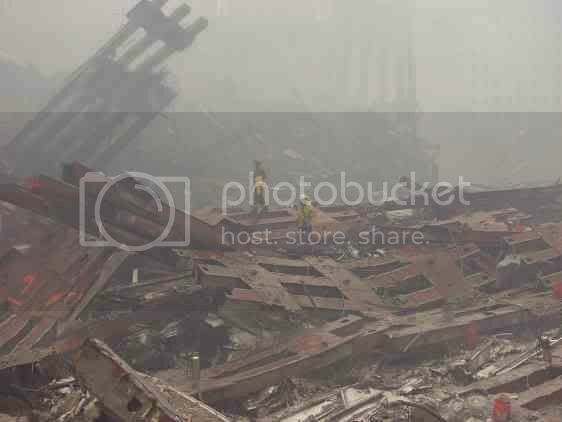 (video, photo) of the "hole" in the WTC tower, you know the picture is a fake. A plane cannot go through. Aluminium is a much softer metal compared to steel. of the orange beams with a white border, and from now on, when we see them we KNOW that it is not the WTC crash site that we look at. It is some other site set up for photography and video. peculiar, they look very thin, and possibly the beams are made of board/wood!? a beam of the typical flat-end type, if you enlarge a hi-resolution version of the picture. on display as a dummy in a shop window. Some objects are very characteristic. 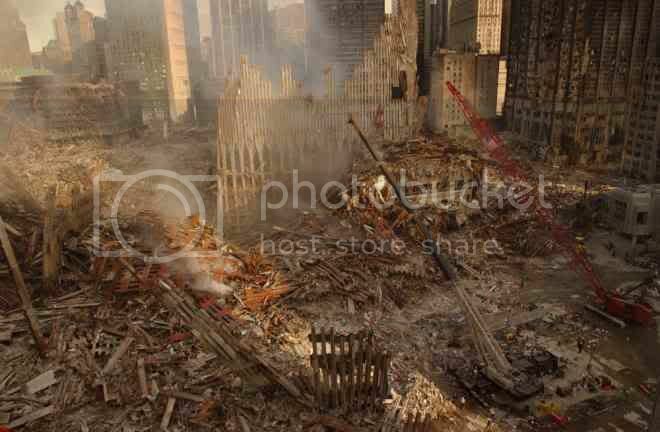 Look carefully at the house or some debris, or the "remaining" WTC façade. Learn what these items looks like, so you can spot the duplicate crash side from a distance. are like on the fake crash site. Note that there is also "documentary film" taken from the fake site. this. Another alternative would be that only the crash site has been replaced. You make sense, Tufa. As all 'live on TV' pictures sent on 9-11 were just a bad movie running on all 5 major US TV channels with its amateurish animations and simulations of plane crashes into towers and strange 'collapses' of WTC1/2 from top down, while the real towers were destroyed from bottom up using standard explosives (like WTC7), it is logical that also all pictures of the rubble are fake. 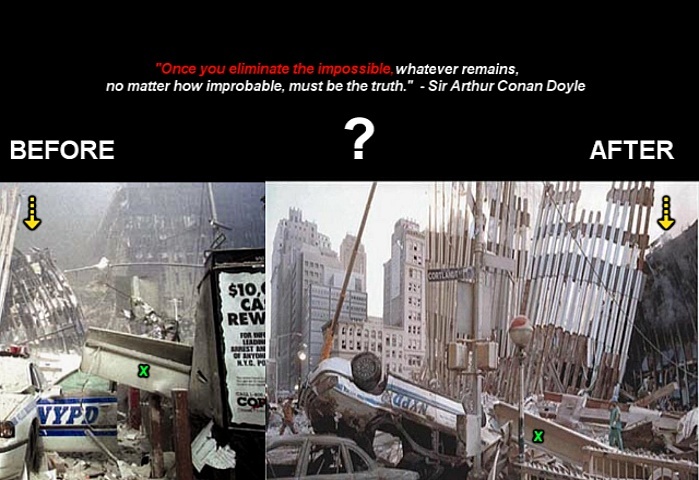 As in all probability the towers were destroyed at ground level (NYFD fire fighters testifying about explosives going off in the lobbies, etc) and then came down by gravity as per usual controlled demolition of steel structures (floors on top of each other, exterior wall panels buckled, core columns cut off at regular intervals and standing beside each other in the rubble, etc), all rubble also had to be faked = a mess of wall panels and some columns as shown. The perps didn't know what to do with the floors so they were left out completely. The result became the strange pictures of rubble that have flooded the net. Good work!